They say that all things come in threes. I say, I bloody hope not! Round 4 was the second week in a row where the entire DT cohort endured a significant amount of damage. How did you fare this week? How are you looking for Round 5? It’s all in the Bullets! They say that all things come in threes. I say, I bloody hope not! Round 4 was the second week in a row where the entire DT cohort endured a significant amount of damage. And we didn’t just cop poor scores and injuries over the weekend, but injuries at training and late withdrawals were bequeathed on us as well. That alone deserves its own Bullet, so more on that soon. So for the second week in a row, par score has been much less than we are used to. A score of 2000 would have even snuck you into the top 11,000 scores for the week! Surely things will improve soon, but while we wait, we get to sweat on the health of winged DT guns such as Ablett, Fyfe and Birchall. Yay. The Carnage just kept on coming this week. Infested. Mid-week we found out that Heath Shaw and Dale Thomas, two DT Guns from years past, were to miss two weeks with hamstring issues. Then some of us had Leuenberger to deal with, as well as a week-long Fyfe saga full of will-he’s and wont-he’s, which was naturally echoed with should-I’s and shouldn’t-I’s. Arrested. Suspension is possibly the most frustrating reason to have a player missing, because you almost can’t trade out a fit player these days. Goodes, Grimes and Lake, three very popular picks, missed this week with suspension and stretched our teams unnecessarily. Rested. Popular players such as Jarrad Redden, Toby Greene, Jeremy Cameron and Clay Smith all earned themselves visits from the General this week. Which would normally be fine, as we would usually just slide them to the bench for a week. Some didn’t have that luxury this week. Uninterested. Why not add a few huge late withdrawals to the mix? Shane Mumford, Nat Fyfe, Grant Birchall, Ian Callinan and Stephen Coniglio were five devestating late withdrawals this week, asall are owned by at least 8% of teams. That’s the definition of carnage. Vested. Why not add some salt to the wounds while we’re at it? Suban, Carrazzo, Wingard, Hale, Goldstein and Higgins (although why you would have Missy in your team after his track record is a mystery) all copped some sort of vest this week. Over the last few week we have seen a few players unexpectedly pump out tons, causing the entire DT public to perk up and wonder: Are these guys for real? Well, we’ve had four weeks now, so I’m going to try and help you sort out the men from the boys. Fools gold. Rance is well on his way to becoming a great defender and possibly a DT star, but he’s not quite there just yet. His average stats are boosted by that Collingwood game where the Tiger backline played kick-to-kick and he totalled 138. Take that out, and he’s scoring at a much more realistic 72 DT per game. As much as I hate to admit it, I think Johnson could be the real deal. He hasn’t scored under 72 which was his Round 4 total – that’s some consistency we’re rarely seeing in the backline these days. Ross Lyon works in mysterious ways, and it seems like he wants to use Johnson a heap across half back. Geary has shot up $82k and still has a BE of 9 heading into Round 5. He was perhaps one of those underpriced defenders that actually got overlooked, with most preferring Hargrave, Lake or Golby. But he’s been great value so far, scoring 77 or more each week of the season so far. He will rarely ton up, but he should be solid for the rest of the year, although not quite at the level he’s scoring now due to St. Kilda’s easy early fixture. Verdict: Overperformer, but still great value. Who would have thought that after a month, the highest scoring Selwood would be a Scott and not a Joel? Reasonably talented family. Scooter has relished his freedom from that negating role this year, and as a result is averaging the 6th highest league-wide. Don’t forget the Eagles’ easy early draw, though. While I think he’s a legit scoring threat, I don’t think he can keep up his current form over a whole season. Four-straight tons in a cellar-dwelling team like the GWS? That’s Ablett-like. Callan is carrying the Giant midfield and he’s getting the points for it. I can’t see this changing, because while GWS’s year isn’t going to get any easier, it’s not going to get any harder either. He’s still great value at his current price, so definitely consider if you want a P.O.D in your midfield. Ryder is the second-highest averaging ruckman right now, and there is a fair bit of daylight either side of him. He’s benefitted from a two-pronged ruck division, unlike the three-headed ruck beast Essendon unleashed in 2011. My biggest concern is that hiss scoring has been steadily dropping since Round 1, and that he’s possibly overvalued. I expect him to average more around the 80’s from here on. Three-straight 90-plus scores makes Waite an interesting proposition. Yes, he has the ability to drift out of games completely, but with the Blues up and about he hasn’t missed a beat. Can he sustain that average? Probably not, but he can definitely go close, which has to count for something with many premium forwards underperforming to date. You have to be prepared for the odd 60 and a suspension here and there, though. I think we saw the real Whitecross on the weekend, after three weeks of exceptional performances. Whitecross is the typical early-season performer who cons you into trading him in then proceeds to blast a hole in your DT for the remainder of the year. With Hodge still to come back, you have to wonder where he fits in to the Hawthorn scoring machine. I have a feeling he’s not a vital component. After a red-vested 16 in Round 1, Clancee has gone on to score 95, 115 and 109 in the last 3. Delisted at the end of last year, Pearce was given another chance and apparently has impressed Lyon so much that he’s not become an integral part of the Dockers’ attack off halfback. As I said earlier, Ross works in mysterious ways, and he looks to have anointed another designated scorer in Pearce. Verdict: Legit, still great value. It should come as no surprise that Stanton takes first place in the Makers this week. The much-maligned (or previously much-maligned, maybe?) Bomber ran an undermanned Carlton ragged, collecting 36 disposals (including 28 kicks! ), 17 marks and a goal. 17 marks! I think it’s safe to say Stanton is the +6 combo King. 175 points this week was easily the highest score, dwarfing Rockliff’s 143. Stanton is now the 5th most expensive midfielder at $548k, but he also has the 2nd-highest average behind DT royalty in Ablett with 134.2 DT points per game. Giles was a lifesaver this week. 101 DT points in the absence of back-ups in Redden and Stephensen was crucial to almost every DT side this week. Mumford’s late withdrawal could have made it even more essential, as a Mummy-Giles-Redden-Orren ruck structure would have been forced into a trade or a donut. Giles is ticking along very nicely, going at 86.8 a game with a R5 BE of -10. Is there any bigger force in the game than Aaron Sandilands? The mammoth scored 122 this week, his 3rd ton on the trot. He is currently the highest scoring ruckman; and by a country mile after Cox and Ryder had down games. Those who took the gamble on him despite his reported calf niggle are reaping the rewards now and probably will do in the near future. Great pick. Dane Swan has taken a little while to get going, but he’s done it again, and against his bunny team in Port. 36 disposals and 7 tackles culminated in 134 DT points, who were all the more valuable with popular captain choices in Boyd (84) and Ablett (97) failing to fire. Ryan Hargrave’s 111 points might have been cheap but I don’t see anyone complaining. 18 of his 26 disposals were uncontested, and add that to 8 uncontested marks, and you have the perfect junk-time game. Just as the highest score of the week was the top Maker, so is the lowest score of the week for the Breakers (well, almost. Petrenko had 0). Carrazzo has been one of the few highlights down back this season, averaging 98 over the first 3 rounds. But a tough driving tackle caused a fracture in his shoulder, ruling him out until much later in the season. And that’s bad enough news as it is, but the injury occurred early in the first quarter after he had only registering the single point. That’s a week ruined, a forced trade and $40k loss. Ouch. Whitecross was the talk of the first few weeks, scoring at will in a packed Hawks side and often against tough opposition. With Fyfe in doubt, many turned to the highest scoring forward at that point so far, but to no avail. 41 points was disappointing, but not exactly surprising – DT stars are rarely born overnight. Chad Cornes is another in the Whitecross basket – great to start to year, which resulted in a big jump in the percentage-owned category. After 2 tons, Cornes dropped off with 74 in Round 3 and only 26 on the weekend. Again, disappointing but not unexpected. This might have to be the last time Goldstein is inducted into the Breakers, because I don’t think we can consider him to be the same premium ruckman that he was last year. H-Mac has killed his mojo, restricting Goldy to 33 and a red vest to take his season average to 53.3. Not even close to the 99.4 average you paid for. It’s a bit tough to name someone a Breaker when they score 76 DT points, but I think we can make an exception for Buddy, who is so often the exception to a rule. The feisty full-forward notched up all the wrong stats, kicking 1.6 and earning himself a massive 7 free kicks against. To put it in perspective, if he had no FAs and kicked, say, 4.3, he would have totalled 112 points. I don’t think so. He’s playing the same role as he has all year, but we’re seeing the Giants execute a different playing style each week. In R1 when Kennedy scored 116, the Giants were playing that Hawthorn-influenced high-possession-backline style of footy. Since then, I’ve seen flashes of Collingwood’s boundary-line technique as well as plain and simple long kicking to 1-on-1s. I expect Kennedy to average around 60 for the rest of the season, and I wouldn’t be surprised if he was next in the general soreness rotation at GWS. I didn’t see the game live, but I watched some footage today and he seemed to do a very impressive job. The great thing about putting a ball-magnet onto a ball-magnet is that only one of them can get the ball. For this reason, and given he executed it so well (keeping Boyd to only 19 possessions against a weak midfield like Melbourne’s), I think it’s very possible that we will see Magner in this role in the near future. Ouch. This puts us right in the middle of the Awkward Zone. If it were 4 weeks or more and we’d all be resigned to trading him out, and if it were just the one we’d all just hold on to him without a second thought. Now we have the huge, lingering decision about whether to trade him out this week. At this very early stage, I’ll be keeping him I think – I trust him when he says he can get back in two. Not really. Tippett is a massive risk and probably an overachiever so far this season, while Harvey is too easily tagged for mine. I wouldn’t force a trade in the name of bye structure, so look for an alternative I think. You should have the minimum two customary donuts with the GWS rookies and Porplyzia/Callinan in R11 already, and if not, you should probably consider getting in Treloar this week instead of a premo. Yes, Treloar has a favourable BE of -85 this. Yes, he’s got that handy DPP eligibility. But you only have 24 trades! None of those rookies have topped out yet, so you’re bordering on wasting a trade. Yes. See above. None of the popular rookies have reached their BE yet (except possibly Wingard), so sit tight for a week or two. Watch those breakevens in the meantime. I don’t think I can stress this point enough – if they don’t have an unassailable BE, then keep them and wait until they do. Round 5 is another of those ‘weird’ weeks, with the Anzac Day clash falling on a Wednesday. That means another partial lockout, and another attempt at the VC loophole. Unlike earlier in the year, we should have plenty of options for both the VC (Pendlebury, Swan, Watson, Stanton) and plenty of options for non-playing rookies to enable the loophole if required. Of course, we have a big week in the Tradesphere with players like Carrazzo, Fyfe and Ablett to consider. I don’t have any hard-and-fast rules on either of them, but I will say this: The choices you make over the next couple of weeks, amongst all the carnage, can make or break your season. If you want to shoot up the rankings, now’s the time to trade hard and keep the advantage over those harbouring stars on their bench. Just be warned though, if we’re having this kind of carnage in Round 4, what’s it going to be like in Round 20? And over the MBR’s? Scary thought. Anyway, it’s been a tough week so I thought I’d end with a cheerful meme. Good luck for the coming week! Also, a big shout out to the lads involved in the DT Talk Tbetta Leagues – we’re ranked 17th overall in DT and 27th in SC. Legends! How does Carrazzo and Bernie Vince out, Hawkins and Barlow in sound? It also fits with my bye structure which helped the decision making. Thoughts? Hawkins no, Barlow maybe. Get in someone cheaper than Hawk, and get someone in better than Barlow. Chad! 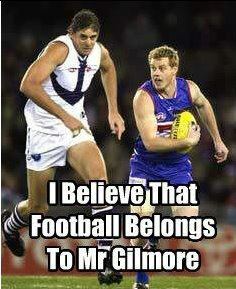 if he plays back all year he scores 100 regulary, trounle is GWS have no fowards! if he plays foward we see scores like on sat! if he plays back we see scores like the first few weeks!!!!!!!!!!! Tippett an over-acheiver!!! BAD CALL!!!!!! he’s averaging 15+ possessions a game and their is no reason this big marking foward won’t continue the trend, he has come of age now as a footballer and these performances will become regular!!!!!!!! I saw Dane swan struggle in the first half of the session then not part take in the 2nd half. I as dr dream team am taking him out of my brilliant team and as he is a waste of money and a midfielder. I would personal pick up Adam McPhee as he is twice as good but half the price. Thank you DT talk community. Stop trolling and get f&cked! On behalf of the DT talk community…. do you have to trade your captain out and then back in (removing the C tag) to do the loophole? There are different versions of doing this depending on whether you go by warnies article or calvins. Also is there an emergency loophole you can do that doesnt involve captains? warnie alluded to one. so i tried to remove the captain tag by trading my captain player in and out but it didnt work. I have no-one who i could presume isnt playing on the weekend in my midfield, so doubt i can use the loophole, but isnt it a bit hard to be knowing who is playing and not on a wednesday?